“The Chinese authorities thought the issue of Tibet would simply fade away, but even after 58 years it hasn’t. In 1959, many countries had no idea about Tibet; they do now. “We’ve been in exile 58 years. We’ve created settlements, re-established our centres of learning. All beyond the expectations of tough Chinese officials. Because of the strength of spirit in Tibet, we in exile have been able to survive. His Holiness outlined his relations with Prime Minister Nehru and the practical advice and support he offered. He mentioned how, following the failure of appeals to the UN for support, it was decided in 1974 not to press for outright independence for Tibet in negotiations with China. His Holiness compared this to the decision of Europe’s nations to form what became the European Union after the Second World War in the interest of the common good. He also likened it to the union that is India, which consists of states that maintain a multiplicity of languages and cultures. Turning to the teachers in the audience His Holiness reminded them that Nehru had advised that the practical way to prevent the vanishing of the cause of Tibet was to educate Tibetan children. He said that having kept the Nalanda Tradition alive in the monastic institutions, school children can be taught about it in a straightforward academic rather than a religious way. “Many problems in the world we hear and see reported in the news arise because people are overwhelmed by disturbing emotions. We can help children understand that observing moral principles like kindness isn’t just about past and future lives, but about securing peace of mind here and now. We can also introduce the idea that when our minds are at peace we’re in a much better position to use our intelligence to the full. From Sera Lachi, His Holiness drove to Tashi Lhunpo Monastery where he was welcomed by the Abbot Kachen Lobzang Tsetan, who escorted him inside. In the course of paying his respects within the temple, His Holiness visited the Tara Chapel and the Lhamo Chapel before taking his seat in front of the throne. The Chant Master led the monks in chanting a praise to Gyalwa Gendun Drup, the First Dalai Lama, and founder of the monastery. Tea and ceremonial sweet rice were served and monks engaged in a demonstration debate focusing on aspects of Shantarakshita’s survey of philosophical views entitled Tattvasamgraha. His Holiness remarked that what this text reveals is the breadth and profundity of Shantarakshita’s scholarship, qualities he brought to the Buddhist tradition he established in Tibet. 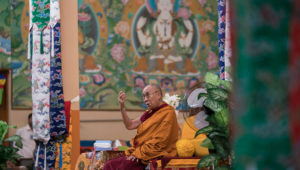 His Holiness also recalled that he began to teach Gendun Drup’s treatise on Dharmakirti’s ‘Commentary on Valid Cognition’ (Pramanavarttika) http://www.sangye.it/altro/?p=7077 during his previous visit. He restated his hope and wish to be able to complete the transmission he has begun. He quoted a line from a praise Gendun Drup composed to Arya Tara, “May I be able to think of others as more important than me; may I discard my selfish motives.” He joked that previous Dalai Lamas were learned and realized, several of them experiencing visions. Although he has had no visions, he said, he seems to have become the most well-known among them. Next His Holiness was chief guest at the Seventh Convocation of the nearby Namdroling Monastery. The Abbot, Gyangkhang Rinpoche, met him as he arrived and accompanied him into the huge temple where he lit the lamp before sitting down. An introduction by Lobpon Tenzin Kunkyap made clear that the focus of the occasion was for more than 300 graduates to receive certificates of their degrees from His Holiness in person. They would then together take a pledge before him to serve the Dharma. The students who were graduating included monks and nuns, some of whom had completed their studies as far back as 2011. Each had studied for nine years, six years learning the 13 classic texts and three years learning about tantra. Special guest, Vipul Kumar, Inspector General of Police Mysuru addressed the gathering first. He observed that in a world in turmoil, the only message that will bring peace is one of love and compassion. He revealed that he had been born in Bihar, not from Bodhgaya and had grown up hearing about the Buddha. He disavowed caste distinctions and suggested that for a citizen of the world we are all one in being human. In his remarks, Khenpo Sonam Tempel noted that whether they are monks or nuns, practice, applying what they have learned in meditation, was important for all graduates. He emphasized the need to consolidate study with reflection and meditation. Sikyong Dr Lobsang Sangay recalled that Penor Rinpoche had first founded the monastery in 1963. Now widely known as the Golden Temple, it attracts visitors from far and wide. He reported the admiration of one of his Harvard professors for the extensive nature of Tibetan literature, the contents of which are now stimulating interest among scientists. He thanked the Government and people of India, as well as the various State Governments for their conciliatory support of Tibetans in exile. 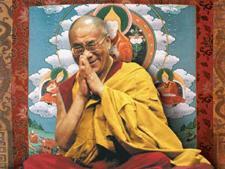 He ended with a wish that His Holiness live long and that freedom may soon dawn like the sun over Tibet. “The late Penor Rinpoche worked hard,” His Holiness declared. “He was the kind of man who once he had started something would see it through to the end. This centre of learning, Ngagyur Nyingma Institute, https://en.wikipedia.org/wiki/Ngagyur_Nyingma_Institute, http://www.palyul.org/eng_centers_ngagyur.htm is part of his legacy. His deeds and spirit remain an inspiration for us today. The flourishing of the Dharma depends on people undertaking study and practice, not on their building temples and statues. There is a colossal statue of the Buddha in Bodhgaya and another of Guru Rinpoche in TsoPema. They provide inspiration, but neither of them will ever speak. On the other hand, if the Buddha were alive today, what he would do is teach. Having emphasized the importance of adopting a non-sectarian approach to study and practice, His Holiness mentioned the teachings he had received from Trulshik Rinpoche and Dilgo Khyentse Rinpoche. Requested to give a transmission of Longchenpa’s ‘Treasury of Absolute Reality’ (chos dbyings mdzod), His Holiness read through the first chapter. After lunch he walked to the adjacent Zangdok Palri temple https://www.guhyamantrika.org/temple-zangdok-palri, http://www.zangdokpalri.net/wp-content/uploads/2013/12/Interview-2009.pdf, to consecrate the Late Penor Rinpoche’s memorial chörten. He then drove to the Tsogyal Shedrupling Nunnery nearby to similarly consecrate another chörten. Many of the 700 resident nuns lined the roads through the nunnery grounds to welcome him. His Holiness returned to Sera Lachi Monastery and retired for the day. Tomorrow he will leave in the early morning to drive to Bengaluru.